After either the airRM or Yieldr API integrations is set up, the objectives section will become available. 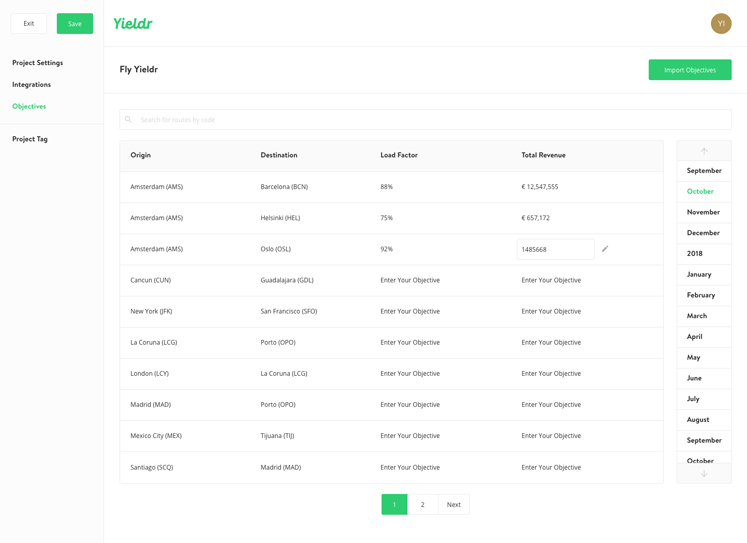 In objectives, you can set and change monthly revenue and/or load factor goals for all your routes you've sent to the Yieldr Platform. You can navigate to your objectives via Settings in the bottom left corner or via the Set Objectives button in the Routes dashboard. Setting objectives is easy; just click on the input field for either revenue or load factor for the route you want to set. Or upload a CSV file with your objectives. Load factor: this must be a number between 1 and 100 (no decimals). It represents the load factor percentage you want to reach with this route within this month. Revenue: this can be any number, with or without decimals. The currency used is the same as the one set in the project settings. Navigating between input fields can be done by clicking the required input field. You can also use tab to go to the next input field, or use Enter to go to the input field below the active one. After you have set an objective you can compare your fleet’s performance against your objectives in real time in the Flights section.